The Sierra Leone Grammar School is the oldest secondary school in West Africa. 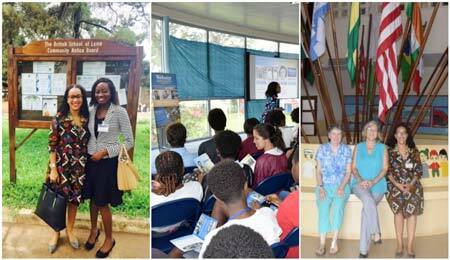 The Webster Ghana recruitment team's tours of high schools to speak with students about opportunities at Webster University included a visit to the oldest school in West Africa. The team has visited 48 high schools in Ghana and in four other West African countries: Togo, Ivory Coast, Nigeria and Sierra Leone. This initiative by Webster Ghana's enrollment management team includes support by campus director Christa Sanders and interim academic director Michael Williams. 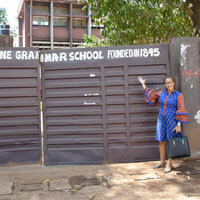 As part of the tour, the team visited the Sierra Leone Grammar School, founded by the Church Mission Society (CMS) in 1845. It was then known as CMS Grammar School and was the first secondary educational institution in West Africa. Other schools recently visited include the American International School of Lome; British international School of Lome; International Community School, Abidjan; Morning Glory International School, Abidjan; International English School of Abidjan; Lebanese International School in Freetown; Ayoub International School in Sierra Leone and many more. The team reports enthusiastic response to the visits, which they expect to translate into additional enrollments from the sub region.